FCA Packaging offers a wide range of custom industrial packaging solutions. With a manufacturing plant in Griffin, Georgia, we can build and design shipping products designed and manufactured from wood, steel, corrugated, or any other material that meets your shipping and economic goals. Whether you need a shipping crate to transport an engine or aircraft parts or custom pallets that can be used to ship products across the country or overseas, we can help. Our engineers have the experience to handle any project and you can expect reliable and on time crating, skidding, and packaging products and services. Our goal is to ensure that what you are shipping arrives safely and securely to any destination, no matter the distance or the mode of transportation. Through the years we have serviced numerous businesses in the Griffin area, as well as surrounding communities such as Atlanta and Macon, Georgia. Businesses of all size have relied on us for their custom industrial packaging needs year after year. Each year our manufacturing plants throughout the country design packaging that protects billions of dollars in products every year. Our customers rely on us for quick turnaround times, typically under 24 hours and often less than 4 hours. Our manufacturing plants provide the critical protective packaging to ship their end products. And when an emergency order is received, they can often be manufactured and delivered within two hours. With plants all over the country, FCA Packaging can help customers and OEMs of industrial equipment with any project locally or nationally. We can meet highly-customized packaging requirements that will protect heavy, fragile, or otherwise hard-to-handle materials and equipment. And we offer fast lead times and limited productions runs. 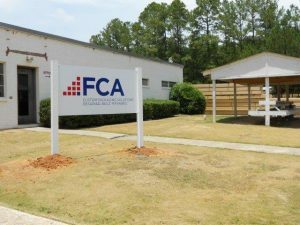 With full diagnostic and ISTA-certified reporting capabilities, FCA Packaging in Griffin can design and test your packaging products to meet your quality and economic objectives. For over 30 years we’ve been assisting businesses with their industrial shipping products and packaging, as well as their skids, crates and pallets. Let us help you. Call our corporate office at (309) 792-3444 to learn how engineers can assist you or fill out our contact form.